Josephine, crowned by Napoleon’s hand as Empress of the French, was a fascinating woman whose political and cultural influence has only recently begun to be recognized. Endowed with legendary charm, Josephine was not only Napoleon’s consort and great love, but a significant contributor to his rise to power and imperial designs. Born on June 23, 1763, in Martinique where her family owned a sugar plantation, Josephine was a widow with two children when she met Napoleon. Six years younger than Josephine, he immediately fell under her spell and married her a few months later, on March 9, 1796. Despite difficult beginnings, the union lasted fourteen years and proved an affectionate and supportive partnership, until Josephine’s inability to produce an heir led to divorce in 1809. During Napoleon’s second exile on St. Helena, he admitted his policies and personal happiness would have been best served by having a child with Josephine, and her name was the last he pronounced in his death bed. For many years Josephine was portrayed as woman of great style but little substance. 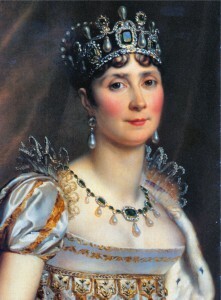 Early biographies tend to dwell on her shortcomings, which include an affair early in her marriage to Napoleon, her tendency to lie, expensive habits and accumulation of massive debts. Since the 1960’s, historians have taken a fresh look at Josephine and a more balanced and positive portrait has emerged. Renowned for her impeccable taste, Josephine commissioned art works that immortalized Napoleon’s victories and helped legitimize Napoleon’s rule. She was the most prominent tastemaker of her age, and her esthetic choices had a far reaching impact on the arts and styles of the Empire. Her preferences in interior design, furnishings, porcelain, fashion, and jewelry made an important and lasting contribution to Napoleon’s policies to promote the renaissance and supremacy of French luxury industries. Empress Josephine was also a passionate and knowledgeable horticulturist. Her gardens at Malmaison acclimatized over 200 species of plants for the first time in France and Europe.